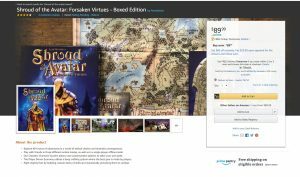 Shroud of the Avatar Boxed Editions $40 off Holiday Sale! 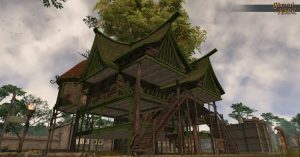 Community Event: Titanforge’s Monster Catch Fishing Tournament! The day after Thanksgiving in the United States is traditionally a day of rest from eating too much and of course HUGE sales! To honor those traditions we are going to extend our Friday 50% items sale through Cyber Monday (November 26). We are also going to extend the stretch goal tracker for that time as well so all purchases from Friday through Monday will count towards the Release 60 Cornucopia stretch goals! 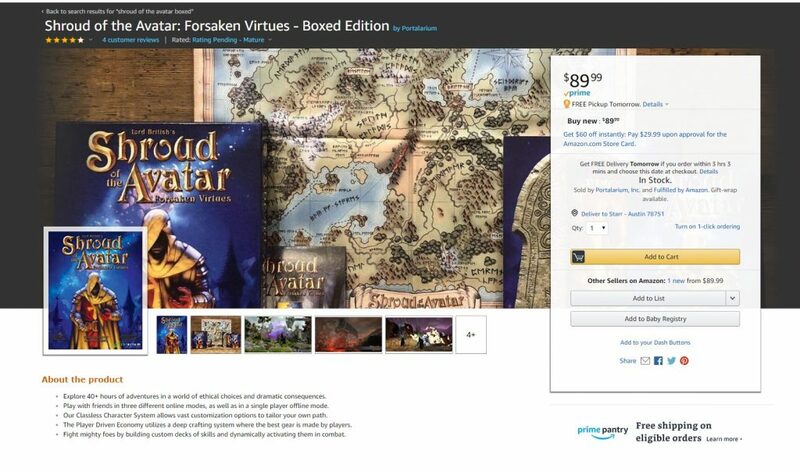 In addition the Amazon Boxed Version is on sale for $19 (a $70 discount from full price)! 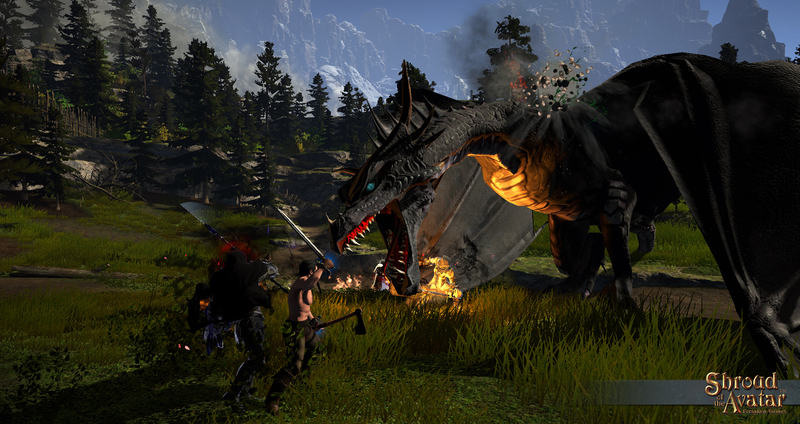 This is the last week to purchase the Viking and Kobold Bundles and select items! To celebrate our first holiday season since launching the Viking and Kobold Bundles are expiring at 11:59 PM CT on November 30. As a limited time bonus we have added Episode 2 access to these bundles! 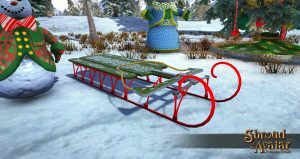 We will also be expiring several of the items that are included in those bundles including pets, weapons, decorations and homes. We are also discounting these items, some as much as 30% For City level bundles this means a $1000 discount! NOTE: This is a final expiration. Upgrades will not be allowed after these bundles expire. 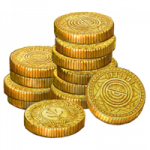 As a special bonus, we are offering funding rewards to any player that makes a minimum purchase of $5 during a twelve hour window during the day of the livestream, on November 2 from 12:00 PM to 11:59 PM CDT (Nov 2 17:00 to Nov 3 5 05:00 UTC). 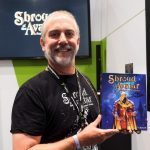 By popular demand we have resurrected a set of stretch goals we missed from previous releases (and added a few new roleplay ones) to make a Cornucopia of Dragons, Dungeons and Roleplay in honor of the harvest season! 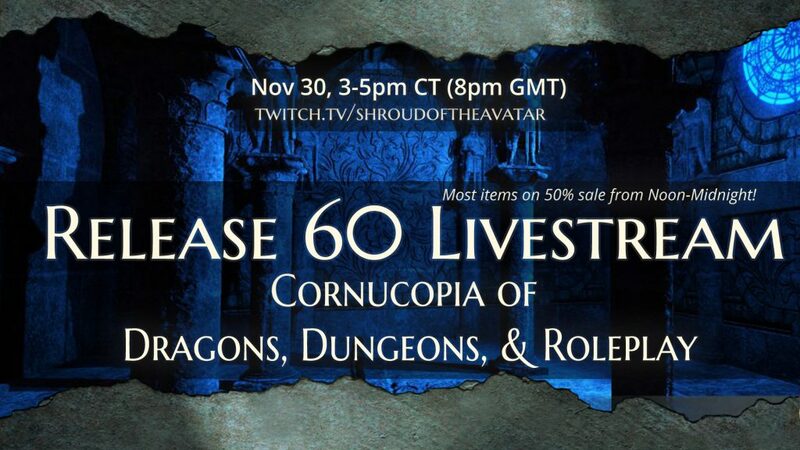 We will be having twelve hours of sales around the livestream from 12:00 PM to 11:59 PM CDT (Oct 4 17:00 to Oct 5 05:00 UTC)! Items in the following categories will be on sale at approx. 50% off. As noted above, all purchases during this time will count towards the stretch goals! 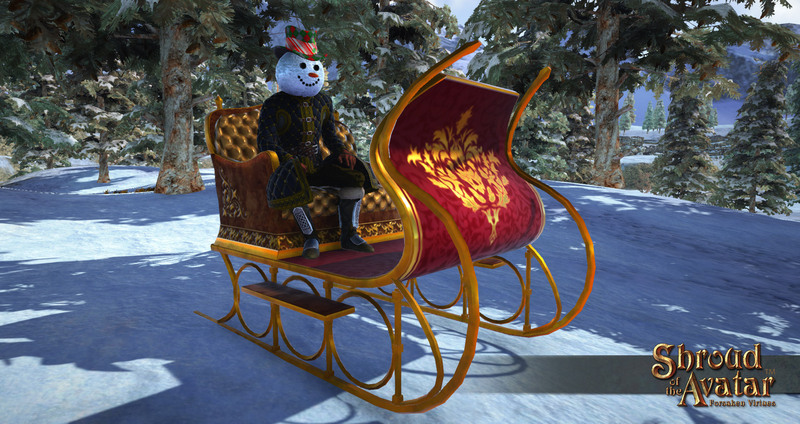 Winter is coming and with it winter recurring items have returned for a limited time, including the Ice Nightmare mask and Ornate Sleigh! 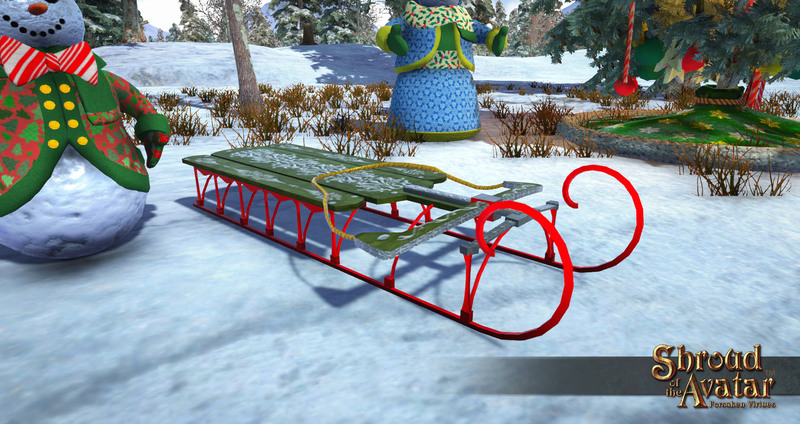 Get these rare items while they are cold because they will go away again until next winter on February 1, 2019. 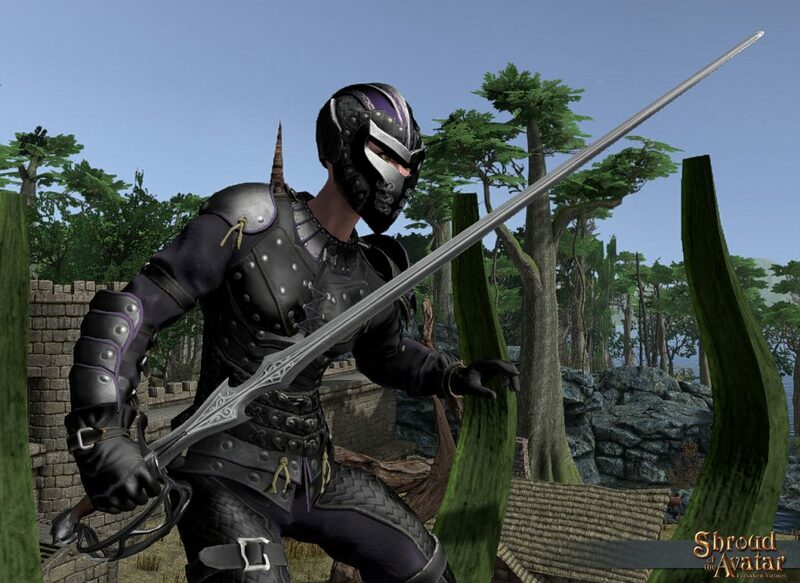 As part of our continuing improvements to Quality of Life in Shroud of the Avatar we are going to remove the extra step required when receiving purchased items inside the game. You will no longer have to click on a “Redeem Rewards” button. 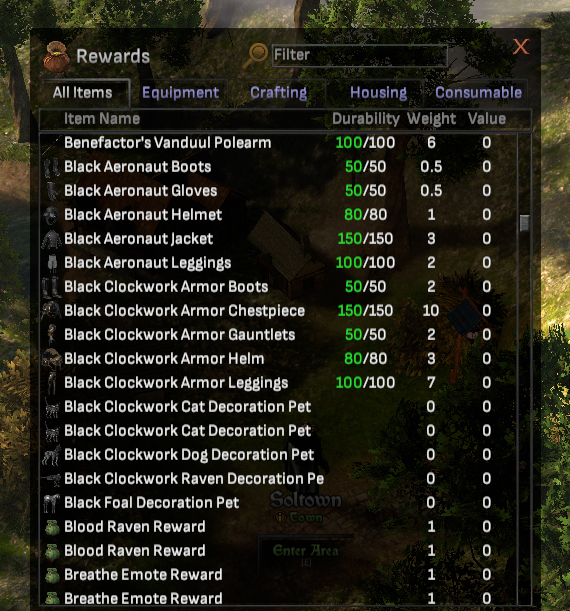 Instead we will automatically send the items to your rewards interface when you next login to the game. If you are currently logged in then they will appear as soon as the purchase transaction completes. 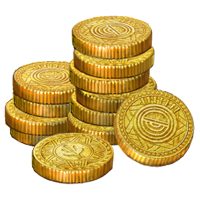 We are also going to provide an onscreen notice for when rewards are delivered to your Rewards Interface. This improvement will go live with Release 61 on December 13, 2018. As many of you know we are expiring all of our bundles before the end of the year. 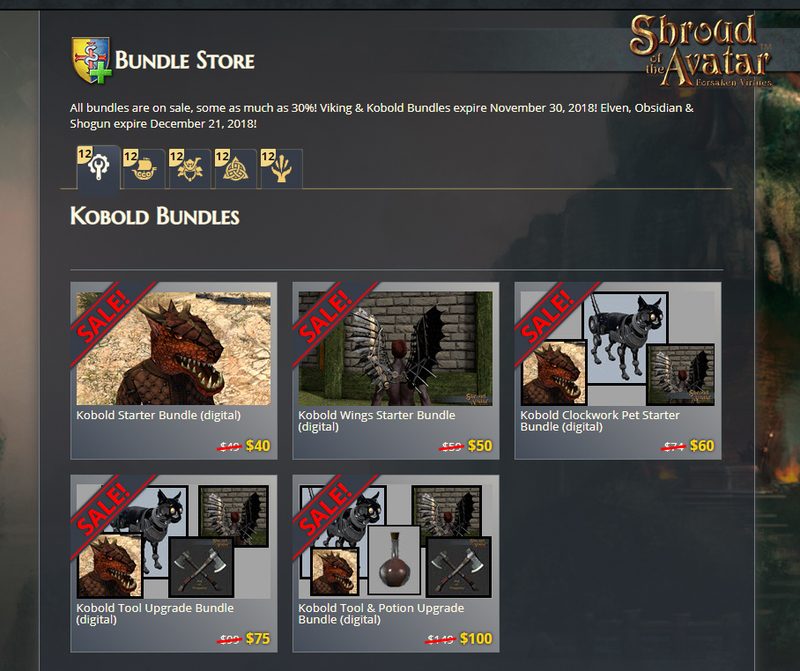 Viking and Kobold bundles expire on November 30. 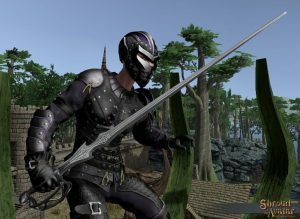 Elven, Obsidian, and Shogun bundles expire on December 21. 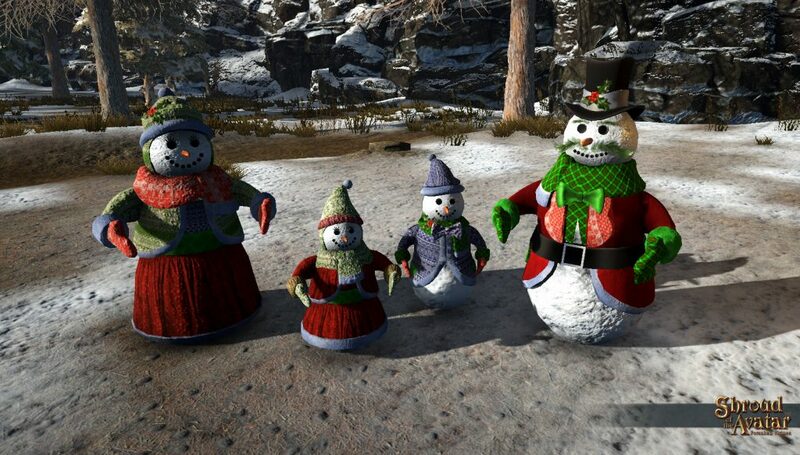 In Release 59 we will be adding the contents of the bundles to crown vendors as single purchases, however they will not have any upgrade functionality. 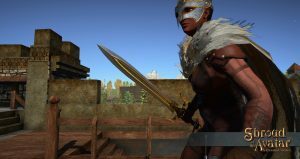 Based on numerous requests from those of you who have been saving up your crowns we are going to offer an alternative path for upgrading bundles using crowns. 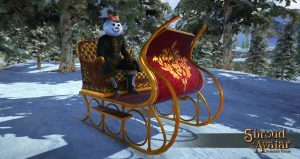 For a limited time (offer ends December 21, 2018) you can purchase a service voucher to use crowns to upgrade your bundle! 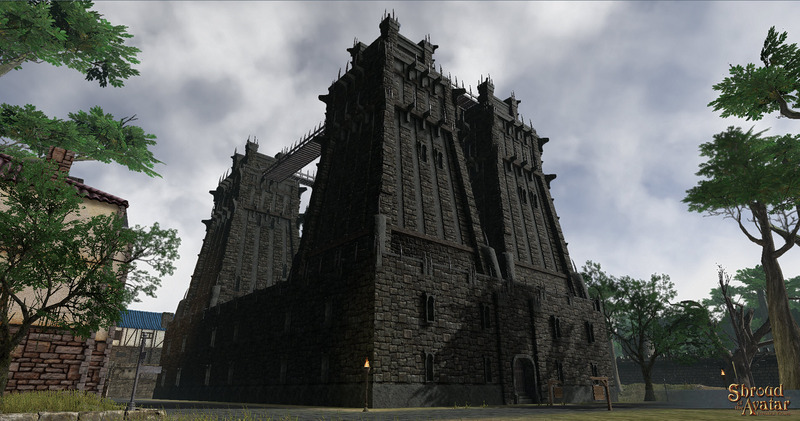 If you wish to upgrade your bundle with crowns please email us at support@portalarium.com BEFORE purchasing the voucher. 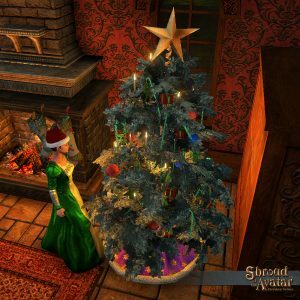 In the request please list the name of the bundle you wish to upgrade, and the bundle you wish to upgrade it to (e.g., Elven 2-Story Row Tax Free Bundle to Elven Village Tax Free Bundle). We will then determine how many crowns you need for the upgrade and notify you of that amount so you can decide before proceeding. Only then will you purchase the voucher and we will then remove the crowns from your inventory. Please note that we will be using the non-sale exchange rates that are currently on the store for this transaction. To celebrate our first holiday season since launching the Elven, Obsidian and Shogun Bundles are expiring at 11:59 PM CT on December 21, 2018! As a limited time bonus we have added Episode 2 access to these bundles! 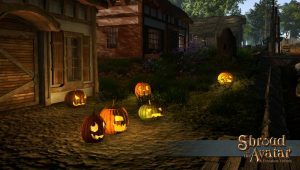 We will also be expiring several of the items that are included in those bundles including pets, weapons, decorations and homes. We are also discounting these items, some as much as 30%! For City level bundles this means a $1000 discount! 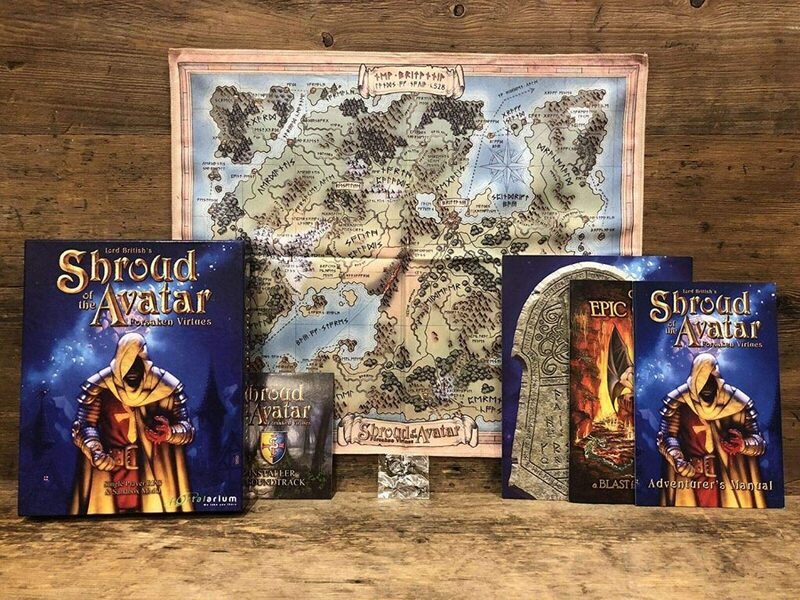 For those of you who missed the opportunity to purchase the Collector’s Boxed Edition of Shroud of the Avatar during the Kickstarter (expired on January 4, 2016) can now purchase the retail Boxed Edition from Amazon. Additionally for a limited time we are also offering a signed version of the retail Boxed Edition (see above) for purchase directly from our website! To celebrate the holidays these two versions are on sale for $40 off their regular price until December 21, 2018 ($49 on Amazon, $99 for signed)! Last week’s beach party and fishing contest in the new Fishing Expedition scene was INCREDIBLE! We had over 250 people participate and our winner, Mia Sway, managed to catch the rarest fish in the game, the Large Tiger Shark! 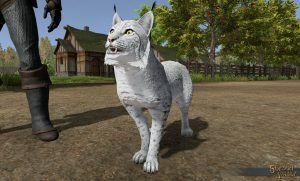 Up to 1275 COTOs could be given away, in addition to a raffle and special town prizes! 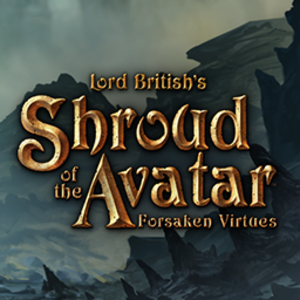 This 7-day, worldwide contest hopes to promote fishing in Shroud of the Avatar and fully explore the possibilities of the fishing system. The goal is to get as many people as possible to catch a trophy fish and reward anglers for the largest catches in-game overall and the largest trophy type of fish. Each contestant is automatically entered to win a raffle for a PoT Taxed Village Deed. Just send one trophy fish to be entered to win. Any trophy fish enters you to win a PoT Taxed Village Deed! You only need one. Get your friends to log in and catch a trophy fish to increase the size of the prizes! The top 3 largest fish will receive a special prize of Gold Crowns! In addition there are special prizes awarded by two governors: Shawn and Titania Xylia. Fish the towns below and the following awards could be yours! It’s possible that more than one person will catch exactly the same fish and size during the contest. The winners will get to vote on either a raffle drawing for the total prize or to split the prize with the other winners. It is possible for one angler to win more than one prize with one catch! 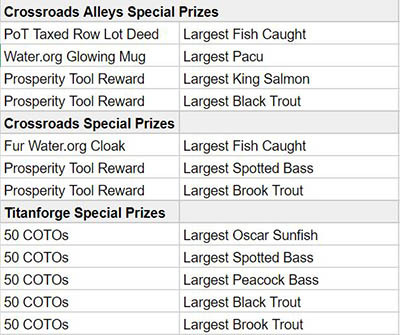 An angler is only eligible to win one of those prizes. Ties will be decided as described above. 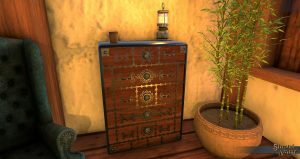 Contestants must send any fish they want in the contest to Titania Xylia via in-game mail or dropped in the chest placed in TItanforge at the dock. Screenshots will not be eligible as entry. You may request your submission back at anytime during the contest unless it is currently on the leaderboard. 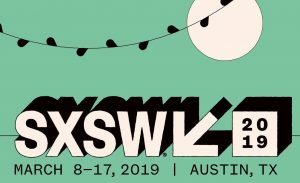 The in-game date on your trophy entry must translate to within the contest’s start and stop time The in-game date, location, angler, fish type and fish length on the fish itself will be used to award the prizes. I would like for the winning fish to be on display in Titanforge for one week after the contest ends, but this is at the angler’s discretion. 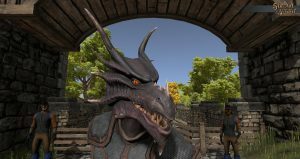 The current leaderboard will be available on shroudoftheavatar.net and a display will be running during the event showing off the fish currently in the lead at Titanforge. You are invited to join the Welcome Quest in Release 60. It will be held on Sunday, December 9, 2018 starting at 12pm (noon) central time/New Britannian time and lasting an hour. It is in your in-game Events book. 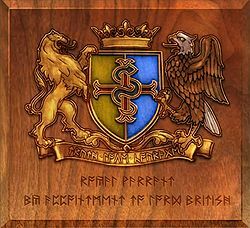 Greagoir Pendragon will be active 30 minutes before the event and during the event. So you can teleport to Greagoir Pendragon if you wish. We are traveling to the town of Ordinis Mortis , south east along the river from Central Brittany. Come to Jade Valley near the Elysium Mines. It’s a Player owned town. When you land on the bridge check your map, find the Jade Valley Graveyard marked, and go there. The quest is in the graveyard. You will find the first 2 books on a pedestal at the entrances. 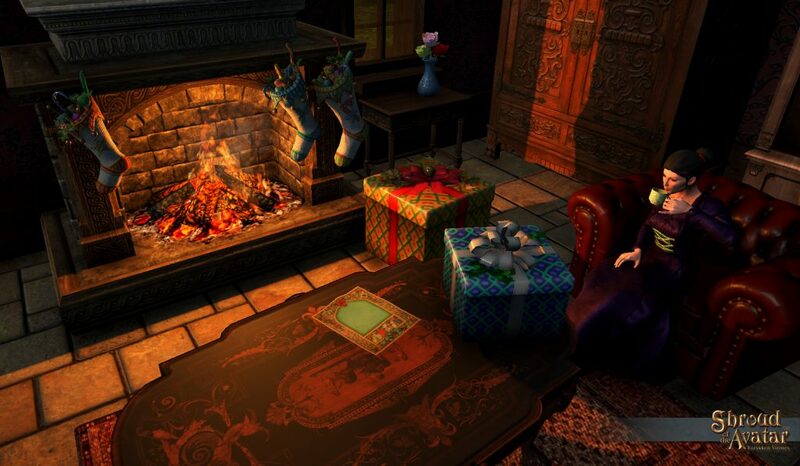 There is a prize for finishing: It is a copy of the story, a candle, a chair, a rug, and a bowl of dragon stew. Brought to you by the Jade Valley community; May your ancestor’s wisdom not be forgot. Win a Circle of Stones Rift Dungeon Entrance plus 125 Point Dungeon – AND earn free SotA in-game items daily! 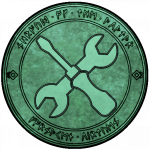 Whether you move a little or a lot, Meretz users rack up valuable Meretz Points (MPs). 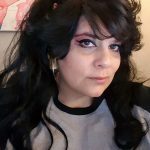 We’re talking potions, emotes, sweepstakes, giveaways, and tons more! With Meretz, we launch a new sweepstakes every month. 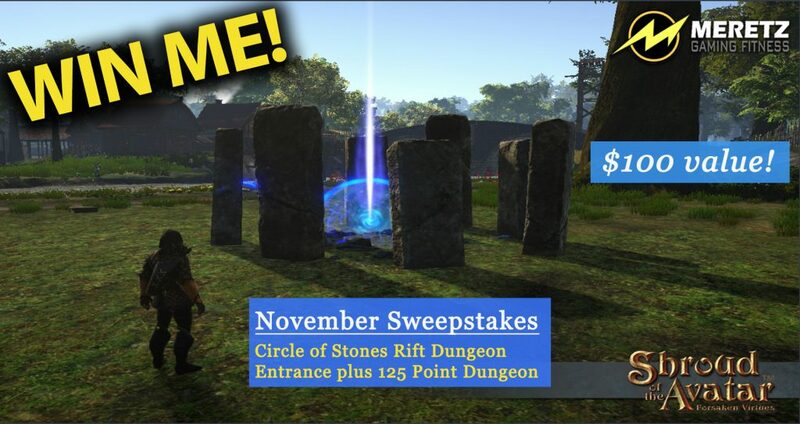 This month, we’re giving away a Circle of Stones Rift Dungeon Entrance plus 125 Point Dungeon – valued at $100! You can also enter to win a Relics By Rild $50 Gift Card and other cool prizes. What are you waiting for? Download Meretz TODAY! 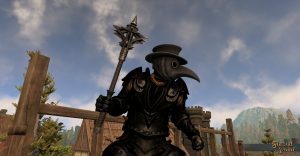 Looking for different dungeons to explore? 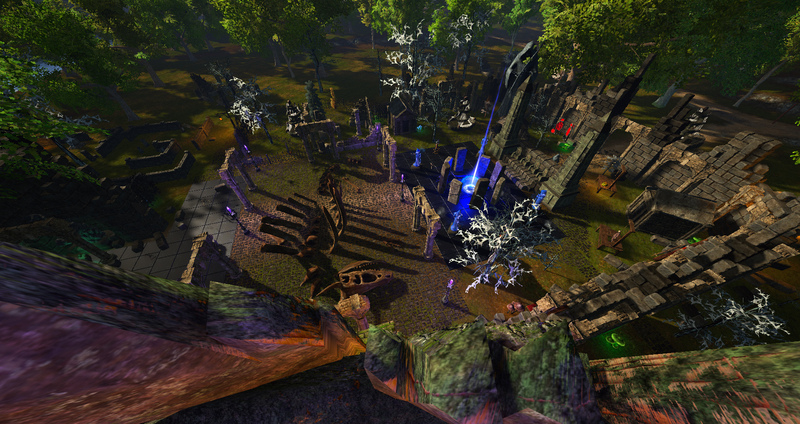 Our friends at OtherSide Entertainment just launched Underworld Ascendant on Steam! 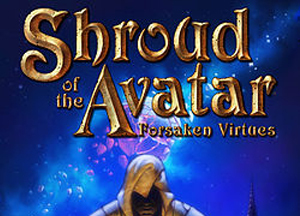 The team includes people who created games like Thief, System Shock and the Underworld series. It’s a first-person dungeon Action-RPG where there’s no one right way to play. 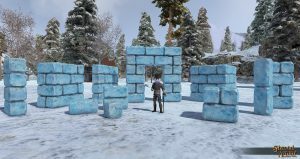 Mix and match a variety of different skills to sneak, fight or use magic to survive this large and highly-interactive dungeon full of traps, monsters and challenges. 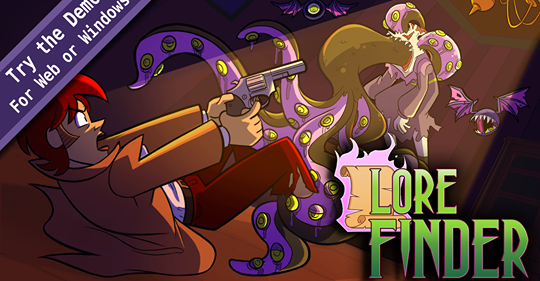 Play now to receive bonus items and a 15% discount: Purchase on Steam! 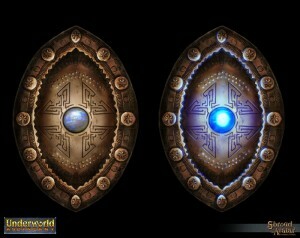 And as a reminder our worlds are tied together with similar world origins and portals between! You can even purchase cross promotional items but you must be quick as they are expiring soon! 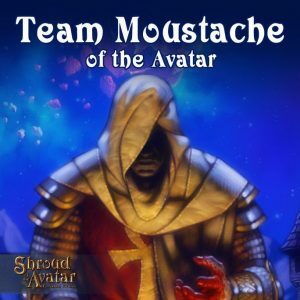 Every year we form a Movember team called Moustache of the Avatar to raise funds for Movember. To date we have raised over $3300 through fundraising for Movember. 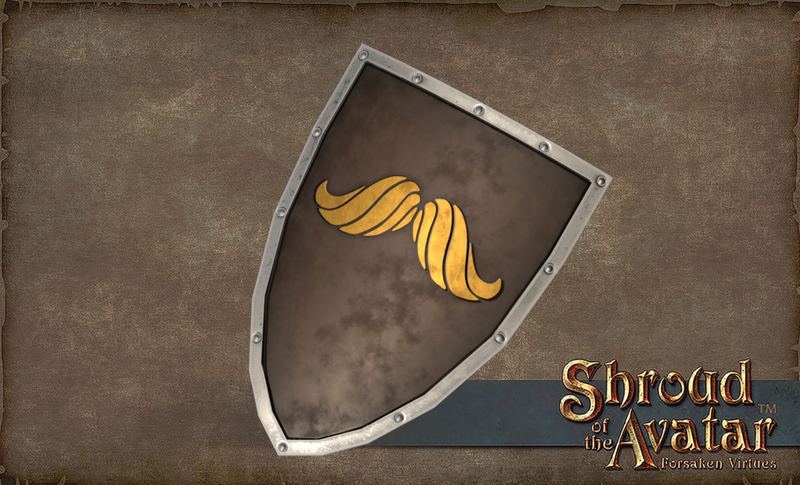 We have also created dedicated items for our Movember Make a Difference store including a Moustache Helm, Shield, and Cloak. Last year we even created Darkstarr and Lord British Follicular Reliquaries with Darkstarr and Lord British versions of the Movember items. Those items and other Movember tagged items have raised over $7,000 for Movember to date! Discover forbidden lore which warps your body and reality itself. The more you know, the worse it gets. 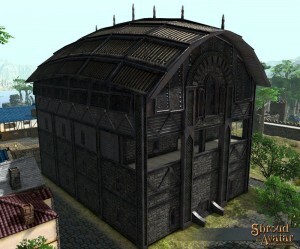 Try the demo right now in your browser, or download the PC Windows version. 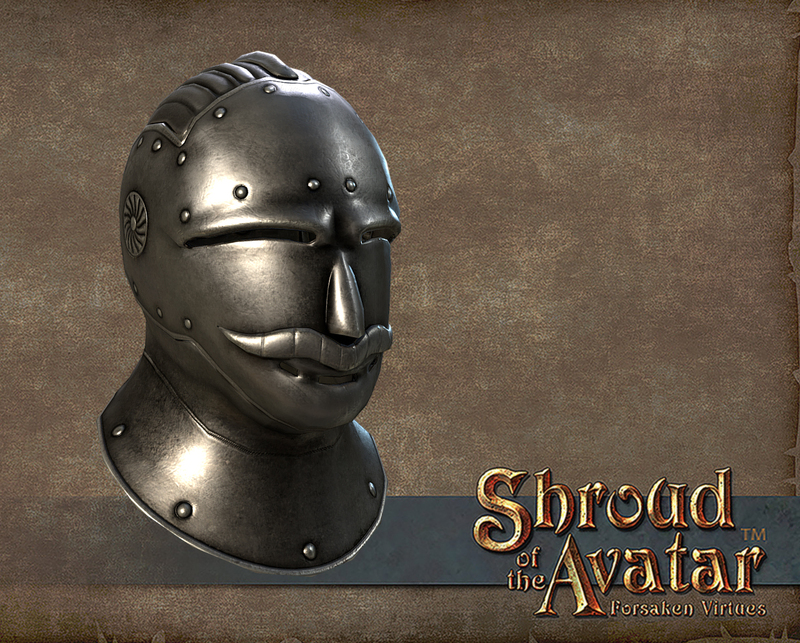 Support the Kickstarter from Enniko who helped develop the musical instrument system for Shroud of the Avatar! According to the live fundraising ticker, we were almost at the Traveller’s Wagon. Is that still the case?